Roundstone is a charming and picturesque fishing village which is situated on the Atlantic coast just south of Clifden, Co Galway. It’s quaint harbour is home to a motley fleet of fishing boats ranging in size and diversity from trawlers to traditional currachs. 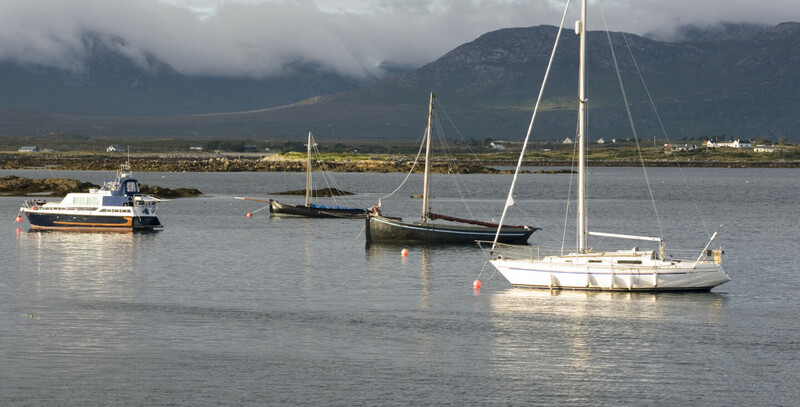 Roundstone’s name comes from the Irish “Cloch Na Ron” (Rock of the Seals), a very beautiful fishing village which should not be missed on your trip to Connemara. Roundstone has 2 fantastic beaches within easy access of the village. Gurteen Beach is the larger of the two local beaches and the closest to Roundstone. The water is crystal clear and it is very safe for swimming and other water based activities. Dogs bay is a little smaller but otherwise perfect! The locality has many historical, geological and scenic points of interest too. The remains of an ancient monument to St. Brendan can be found on Inishnee (a small island in Roundstone Bay) and you’ll also come across the remains of various other Christian settlements on nearby islands. The ruins of a 15th century Dominican Priory can be found 2 miles north of Roundstone. Visiting Roundstone - Stay with us at Connemara Coast Hotel and relax in our outdoor hot tub as you watch the colours of the sunset resting in the calm waters of Galway Bay. With the serenity of our location coupled with our spectacular views, coastal walks and rugged landscape we can guarantee you getaway to remember.